Detective Elliott “Eli” Robinson and his new partner, Ava Aguilar, are baffled by a series of brutal murders happening in their fair city. No evidence, no eyewitnesses…only mutilated corpses with missing internal organs. When Eli and Ava stumble upon evidence of similar gruesome crimes around the globe, they realize there is more to the murders, but the answers continue to elude them. In a race against time, Eli and Ava must figure out who is behind the killings and stop them before more people die. But the answers will take them out of their comfort zone and into the realm of the fantastic: another world with a different set of rules, and a leader who has no qualms about killing. 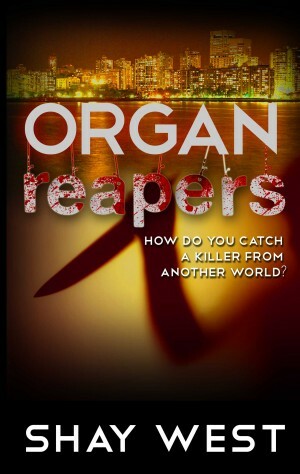 Organ Reapers is a very interesting urban fantasy book, it's like nothing I have ever read before. Shay West is a talented wordsmith. This is the first book I've ever read by her but I look forward to checking out her other works. I'm not going to lie I was a little worried that I wasn't going to like this book. I don't usually read books that follow detectives because it reminds me too much of Law and Order but Organ Reapers was actually refreshing. I ended up loving the detectives and enjoyed seeing the other side of the law. It followed two sets of people and even though sometimes that can be very confusing, it was very easy to follow. Eli usually works alone but just got assigned a new partner, Ava. He starts to fall for her but of course since they are both detectives he can't pursue her. I really liked their partnership, they complimented each other well. Tani and Keena are also work partners in a way but it's cute how much you can tell they like each other. In their world you can't show affection unless you are married (which they are not) so it's even cuter when they sneak a hand hold. Eli and Ava are detectives that are trying to solve a string of murders. Tani and Keena are organ harvesters, in their world that is a sacred job. (They use magic to travel to this world to kill and steal the organs of innocent people, to save the people in their world.) When Ava and Eli start working these organ harvesting murders, things get weird because how can you catch someone that can travel to another world? After Tani and Keena get a job that involves the murder of a child they decide they can't do it anymore and they run away. After having visions from their Gods they know what they have to do. They end up teaming up with Eli and Ava so they can forever close the gates connecting the two worlds. I loved Tani and Keena, especially when they came to this world to help Eli and Ava because their world is in the olden days. They still lived in the renaissance times, so it was cute when they tried to figure things out. I loved the epilogue, it was the cutest thing! I think the two worlds were blended together nicely. I've read books that tried to do something like this but it didn't work as well for them. This was a very good book and I'm so glad I gave it a chance.